July - This month has been extremely busy with our French holiday, Jane at the Whitehall dig, balloon flights, and, as always, work. All this during a month when we had record high temperatures, violent thunderstorms and monsoon type rain storms. 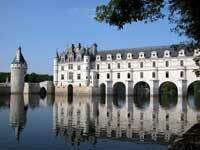 We had never been to the Loire Valley before and our original purposed for going was to take our balloon and fly alongside Dave who was going to be working their for the summer. Dave's contract didn't work out and so our ballooning connection was no longer viable so we decided to take the holiday without the balloon. It's a beautiful area with large golden fields full of wheat, barley, sun flowers and of course on the south side of the valley there were acres (or should that be hectares) of vines. Click here for more pictures and information. When we were on holiday we experienced a violent storm that brought, thunder & lightning, horizontal rain and a wind that blew the trees around close to breaking point. 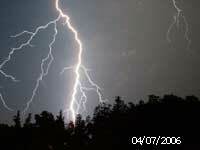 In a similar time frame there was a storm here and the lightning struck the telephone system. We received a text message from our house guests, Ian and Sue, to say that the phone was not working and although they reported the fault to BT because they were not the householders BT would take no action. 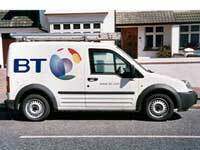 On our return from holiday Steve contacted BT and the story really began to get complicated. So our call to BT was registered on 9 July and the engineer visited on Thursday 13 July and replaced the master socket which had been toasted by the lightning. We then discovered that the answer-phone and wifi adsl router had also been fried. Steve went to buy a new router from PCWorld but when he plugged it in the phone stopped working. After Steve took two half days off work an engineer eventually turned up to check the circuit only to find that the router supplied by PCWorld was faulty. Another visit to PCWorld where Steve had to convince them that it was faulty - you try explaining the problem to someone who didn't know the difference between a standard router and a wifi router - this was our third so Steve knew what he was talking about. To add insult to injury BT invoiced us for £135 for replacing the master socket. Steve explained to them that the master socket is the property of BT and therefore why should we pay for its replacement. The fight continues - BT haven't yet learned that the customer is always right even when they're wrong. This is the second year running that Jane has missed a week at the dig at Whitehall Farm in Nether Heyford because of a weeks holiday. Steve promises next year this will not happen. The French holiday was great but the dig is such an unusual activity it is a shame to lose a week. Despite the wind that blows up the Villa site from the Grand Union canal, the very hot weather meant it was a labour of love actually excavating. 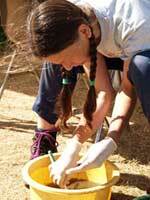 Jane found she was more often scrubbing finds as this was where the manpower was needed. One of the good finds was a broken but whole tegula (roof tile), the pieces of which she glued together. An excellent daily blog of the dig was created by Jeremy, who is also the creator of the website. Click here for more photos and information.